In the previous article, I spelt out what could be considered the tendency towards a ‘dumbing down of teacher training’, using the example of the overuse of jargon. However, I think this example is indicative of much deeper, more fundamental issues. Here, I will illustrate this phenomenon with further examples I have seen in practice on teacher training programmes, and suggest some possibilities for positive change. The following chart summarises three problematic examples I’ve seen on different CELTA courses. As no discussion of classroom or training room issues is complete (or even justified) without some consideration of what the course writer’s inherent beliefs and assumptions about the learning and training process might be, I also speculate about these. In the third and fourth columns, I identify what exactly I think is problematic with these approaches and some potential results. I’m not one to rant about my problems, so I’ve taken the liberty of suggesting some possible alternatives to the very same issues I’ve identified. 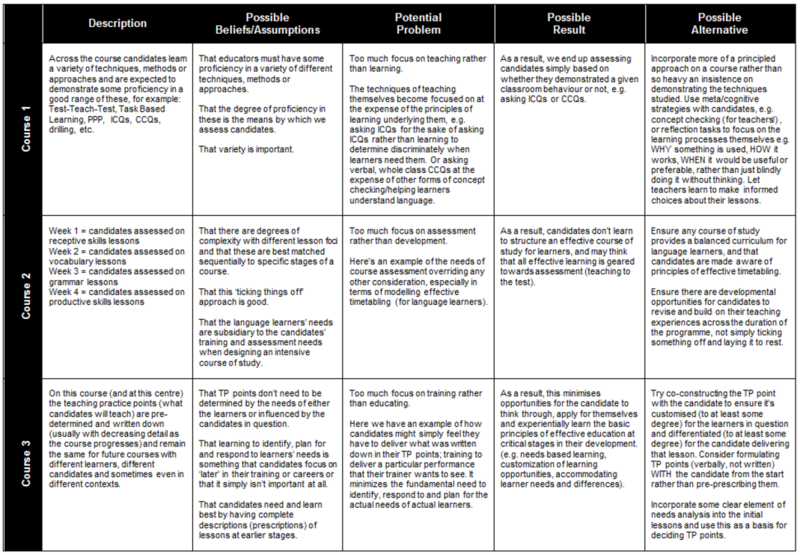 See the chart in all its metacognitive glory. You will see from the suggestions in the chart, positive change does not mean we have to cram in more into teacher education programmes (indeed, if done well, it can mean we can do less); rather, it requires a paradigm shift in our thinking and the way we go about doing what we do. But we do need to make sure we don’t try and squeeze our training into a one-size-fits-all approach. And we do need to be willing to question our assumptions about stages in teachers’ development processes. Working with elements of needs analysis and managing differentiation are no longer understood to be things that teachers graduate to later in their careers, but are conceived of as so fundamental to the learning process that they are focused on and expected at the beginning of many teacher education programmes, especially in the primary and secondary sector (Gould, 2004). Naturally teachers will be better at these things at later stages of their development, but this is the case with many things in life. This is not a reason for ruling out focusing on such fundamentals at the earlier stages of teacher education, which are often the more crucial, formative stages. Teachers, like other human beings, ARE capable of higher order thinking skills. 1) Do away with assessment (criterion-referenced or otherwise) based on demonstration of techniques or methods (or jargon!) in favour of assessment (criterion-referenced or otherwise) which focuses on evidence-based quality of performance and quality of learning opportunities. (Of course, HOW we now measure learning of this is where the debate lies – and scope for a whole separate article). 2) Base courses on a principled approach to educating, i.e. the principles of effective learning rather than the demonstration of techniques and methods. After all, as Prabhu has claimed, ‘there is no best method’ (Prabhu 1990). There will naturally be some variation in what these principles are, but they can include principles such as: learner needs and differences, responding to emerging needs, managing differentiation, etc. We need to start conceiving of ourselves as ‘teacher educators’ more rather than ‘teacher trainers’; we want to upgrade ourselves, not dumb ourselves down any more than what we already have simply to satisfy the constraints of timetabling and assessment. With regard to incorporating elements of needs analysis and differentiation into training programmes, I will always defend the position that the fundamentals are just that, the fundamentals: ‘I’m a fundamentalist teacher educator!’ Fundamentals should be our starting point, not something we graduate to at some later stage. Learning is cyclic rather than linear; give candidates opportunities to visit and revisit such fundamentals (with increasing degrees of complexity, proficiency, reflection, or critical thought) at key stages in their development across a course, including near the start, for these are often the most formative stages. A CELTA course is only as good as the trainers who deliver it, and arguably, some courses ended up being better in spite of, not because of the trainers delivering them. No one wants to provide dumbed down training, and none of us should want to be dumbed down trainers. Let’s raise the bar. Gould, H. (2004). Can Novice Teachers Differentiate Instruction – Yes They Can! Available: http://education.jhu.edu/PD/newhorizons/strategies/topics/Differentiated%20Instruction/novice. Last accessed 21/5/16.